There’s no better way to celebrate Easter than with family, friends and Mexican food! MAYA will go all out this Easter to lay on a fantastic array of delicious foods. 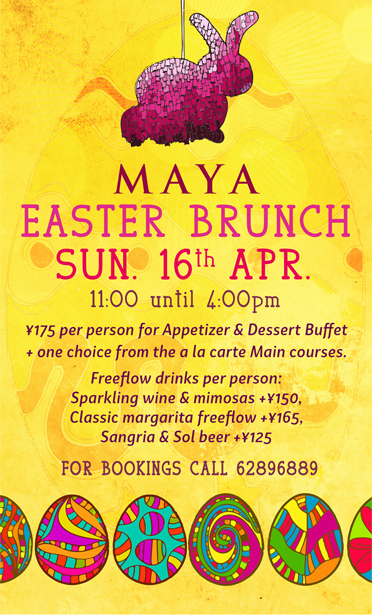 On Sunday, April 16 from 11am-4pm MAYA will be hosting their annual Easter Brunch Buffet. For just RMB175 per person, you can enjoy an impressive appetizer and dessert buffet, as well as one choice from the a la carte main courses, which range from Chorizo Scotch Eggs with watercress, roasted potatoes and chipotle hollandaise; to crispy cod-cake with a poached egg, spinach and chili hollandaise; to Buñuelos with palm sugar syrup, whipped cream and fresh fruit salsas. Our buffet will offer up a choice from chips and four salsas bar, spiced chicharrones, chorizo & potato taquitos with chipotle cream, seabass ceviche w/ passionfruit, spiced corn soup w/ blackened chicken, MAYA tres leches cake and much more. What can make this even better, you say? A drink deal! In addition to brunch, guests can enjoy free flow drinks at the following prices: RMB 150/person for sparkling wine and mimosas, RMB 165/person for classic margarita and RMB 125 for sangria & Sol beer.